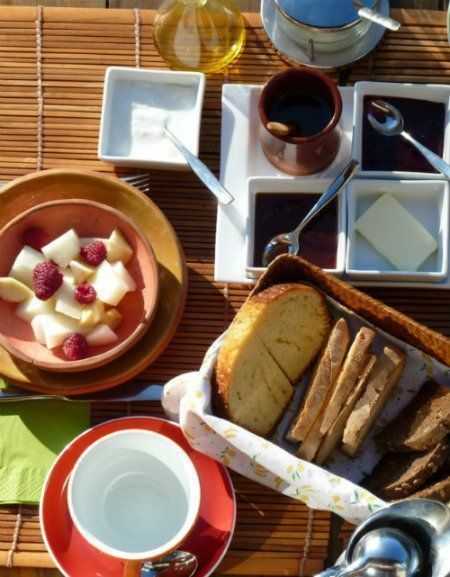 Having breakfast quietly, contemplating the landscape while enjoying a cake or different types of bread, with butter, homemade jam, jelly or local honey is, no doubt, the best way to start your day. And you can accompany all that with yoghurt, compote, fruit juice or fresh fruit. And, if the weather allows it, you can have it in the garden. Good food is basic at our Bed and Breakfast. With advance reservation and exclusively for guests, we offer fixed-menu dinners. We know that many people, after a day in the mountains or touring around, enjoy staying at the hotel in the evening. Having dinner at Los Riegos, with a relaxed atmosphere and good service, is a wonderful option. We offer quality homemade cooking, with local products when possible, and our particular style. Our dinner system is a bit “peculiar”: there is no possible choice. It is often a “surprise” menu depending on the season, number and characteristics of the diners. We always ask for tastes, diets and allergies… and we try to compose a menu that pleases and fits everyone. Our cuisine is varied, made with care and good ingredients (some from our vegetable garden) and based on traditional gastronomy. Of course, we add our very special “touch”. Among other first courses, we offer hot and cold creams, assorted gazpachos, rich and varied salads. Second courses include meat stews (e.g. cheeks, stewed meat or chicken curry), bonito or cod, pickled pork tenderloin with chutney sauce and jellies, sometimes game meat, some vegetarian dishes such as stuffed aubergines or ratatouille, sometimes eggs… As for the desserts, most of them made at home, we have different fruit sorbets, quince or chocolate mousse, cheesecake, home-grown raspberries with yoghurt, apple or other fruit cake… and, of course, the typical local cheese, the quesu casín, accompanied by sweet quince or apple. The menu includes wine (Rioja) and coffee or tea. We also have a small selection of higher quality wines off the menu. If our system is not for you, you always have the possibility to dine near the hotel: in the town bar (500 m away) you can eat well with tapas, salads and combination platters. Culinary tourism is famous in Asturias and this area is no exception. Within the Redes Natural Park, there are several places to eat abundantly and well. They are usually that require advance reservation! In mountain gastronomy, stews (mainly the pote asturiano) and meats are of special importance: big game, kid meat, Asturian veal, homemade sausages. And don’t forget the desserts: rice pudding, curd, suspiros, etc. And, always present, the quesu casín, the typical cheese produced in small local artisan cheese factories. “I wouldn’t know what to choose: breakfasts in the garden or the delicious and delicate dinners”.